In November 2012, a salvage excavation was conducted in the Horbat Rosh Mayim, at 49 Palmach Street in the Romema neighborhood of Haifa (Permit No. A-6652; map ref. 200194–229/743798–827), prior to construction activity. The excavation, conducted on behalf of the Israel Antiquities Authority and funded by the Haifa municipality, was directed by A. Massarwa (field photography), with the assistance of Y. Amrani (administration), M. Kunin (surveying and drafting), A. Gorzalczany (advisor), P. Gendelman (ceramics) and M. Shuiskaya (pottery drawing). The excavation area was located on the southern fringes of the Horbat Rosh Mayim, which is located in the heart of the Romema neighborhood. Previous excavations at the site (Permit Nos. A-1819, A-2089), which has a Crusader fortress in its center, exposed remains of agricultural installations, rock-cuttings, cisterns, rock-hewn tombs and settlement remains from the Hellenistic, Late Roman, Byzantine, Crusader, Mamluk and Ottoman periods. During the Crusader period the settlement was enclosed within a wall. 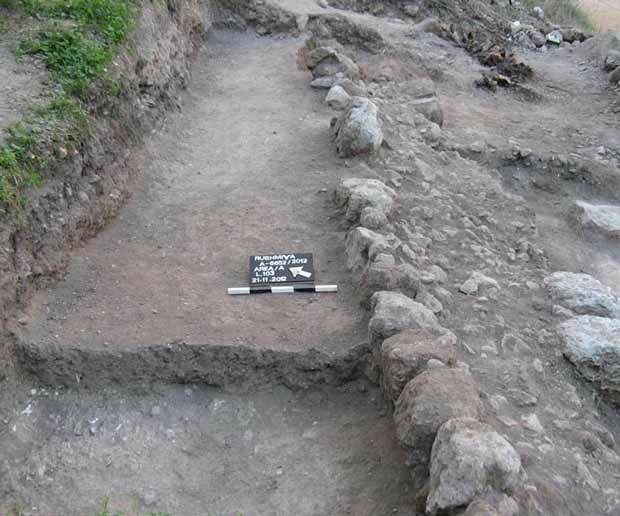 Remains of a wall (W10; length 9 m, width 1 m; Figs. 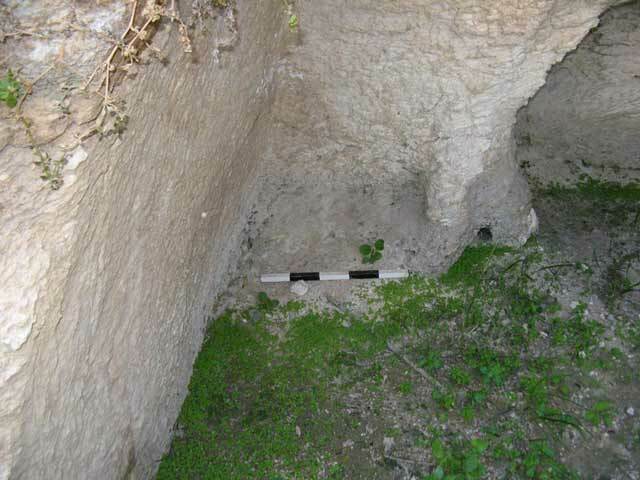 1, 2) built of two rows of partially dressed stones (size of stones 0.35 × 0.35 × 0.40 m) with soil fill and small stones in between were exposed. The wall was preserved to a height of one course and was founded on soil. Pottery sherds were found in the vicinity of the wall, among them a bowl (Fig. 3:1) and jars (Fig. 3:5–7) dating to the Byzantine period. A probe excavated in the wall (L105) yielded fragments of cooking kraters (Fig. 3:2, 3) and a jar (Fig. 3:4) from the Byzantine period. Remains of a burial cave (Figs. 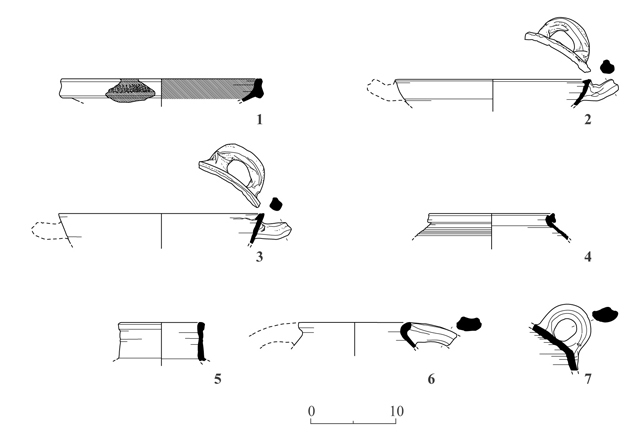 1: Section 1–1; 4) were documented near the excavation area. It was severely damaged when the Marom Hotel was constructed and only one of its sides survived. The absence of datable finds and the damage inflicted upon it make it impossible to date. 2. Wall 10, looking northeast. 4. Burial cave, looking south.